Hapna is a slab serif typeface created by Mariya V. Pigoulevskaya and published by The Northern Block. Featuring 6 weights and over 400 characters and inspired by timeless 1950 type designs, Hapna is a powerful geometric monospaced font perfect for magazines, posters, logos etc. Be productive using Hapna! 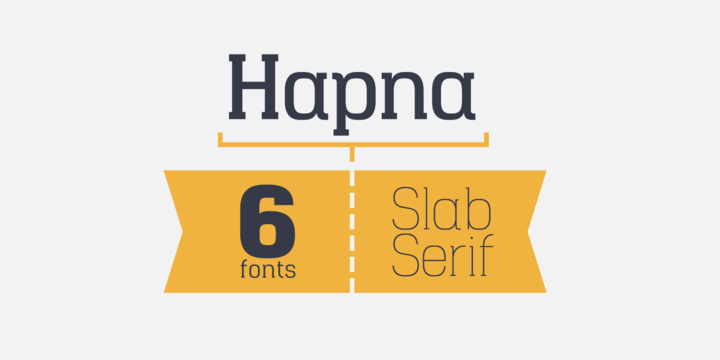 Note: Hapna is a trademark name of The Northern Block Ltd.
A font description published on Tuesday, March 26th, 2013 in Fonts, The Northern Block by Alexandra that has 4,669 views.